Printing photos at Walgreens just got super easy! Download our app for free and start photo printing your mobile photos today! Select your nearest Walgreens store for 1 Hour Photo Prints pickup. Choose your photos, your print size: 4x6, 5x7, 8x10 and quantity. Pay at Walgreens Photo store when you pick-up your photo prints. One of the TOP RATED PHOTO PRINTING APPS! Get Photo Prints of your pictures and pick them up at Walgreens Photo in under 1 Hour. 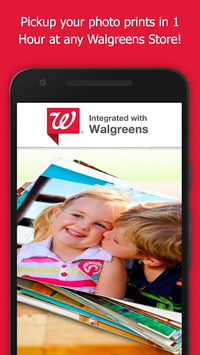 This photo print to Walgreens Android App is the easiest and quickest way to print photos from your phone. This is the easiest and quickest photo print app in the app store to save your photo memories in printed form. We built this app to please our customers and remove the pain of printing photos. You can do this in a matter of seconds with just a few taps. No need for a credit card: pay for your photo prints when you pick them up. The simple way to print photos. Simply select the photos, select the size & quantity, then select the Walgreens photos store to pickup your photo order at. Done! 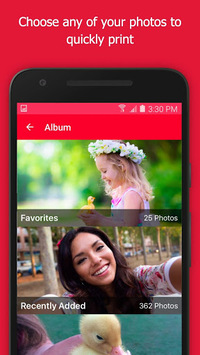 Order 4x6, 5x7 or 8x10 high quality prints of your pictures directly from your Android phone. Very simple way to choose and print pictures directly from your device; no hassle of connecting to photo kiosk. Select the size and quantity of each of the photos you want to print. 4.5 Star Rated and a Top 50 Shopping & Print Photos App on iTunes. This print to Walgreens experience was designed to be super simple, super easy and a very fast way to print photos. We have streamlined the print photos experience and it is so simple anyone can use it to get printed photos quickly at Walgreens Photo store. We have built a technologically advanced and optimized photo uploading experience that is lightning fast; and you will see a snapshot of each photo as is uploaded! Very quick photo uploading on both wifi and cellular. 1 HOUR PHOTO ORDER STATUS: You will get and email instantly to tell you your print photos order is confirmed, and when it is ready at Walgreens Photo. With this print photos app you will get your pictures printed far faster than CVS Photo, Costco Photo, Target or Walmart Photo. CVS Photo is slow and typically takes several hours. We will have your order ready in under 1 hour. Typically much faster. 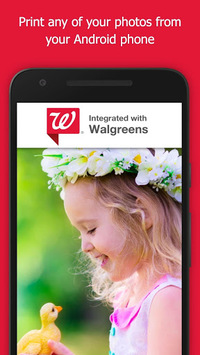 This Print Photos to Walgreens app for Android is sure to please. Faster than CVS Photo. Choose where you want to pickup your order from over 8000 Walgreens store locations in the United States. There is sure to be a Walgreens store close by. This print photos app makes it simple to see Walgreens store locations on a map. Quickly print photos to your local store. Select the Walgreens Photo Store or Duane Read store where you want to pickup your photo prints today. NO PHOTO KIOSK HASSLE: Why hook up to a Kodak photo kiosk? Simply order your photo prints directly from your phone while you are on the go. Go pick them up when you are ready (typically in under 1 hour). This Print Photo App for Android is the easiest way you have ever seen to order photo prints easily... and the photo print app is FREE. Faster than CVS Photo App, Shutterfly App and Snapfish App, no Shutterfly or Snapfish postage to pay. Easy way to print pictures. Save time with the easy way to get pictures printed from your phone. Walgreens Photo Print App. Printing pictures app is easy to use. Thanks for using our Print Photos App. Please let us know your thoughts. We welcome your feedback. Bug fixes and general enhancements. Pickup your photo prints in 1 hour or less at a Walgreens Store near you. Time to print your holiday pictures and memories!